Happy New Year Pallimed readers! Pain has an interesting article on the diurnal variation in chronic neuropathic pain. It caught my eye because I was taught, & I think many people believe, that pain tends to be worse at night. I always attributed it to people being less busy at night, with more time to notice their pain, but clearly that's just a gross assumption that may not be true at all. The Pain article looks at data gathered from the randomized controlled trial comparing morphine to gabapentin for chronic neuropathic pain (diabetic neuropathy and postherpetic neuralgia) that was published last year in the New England Journal of Medicine. For this article they looked at the pain diaries for the patients when they weren't receiving any active therapy & found a distinct increase in pain across the day. 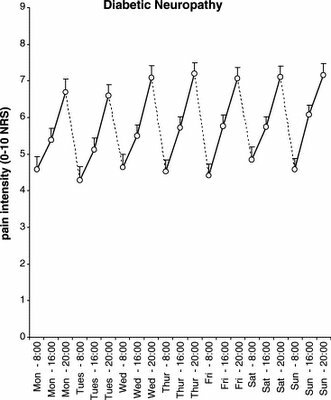 The figure shows the diabetic neuropathy results--you can see quite vividly that the 8pm pain scores were consistently and predictably worse, by a sizable 2/10 points on the 0-10 numeric rating scale, than the 8am scores. They found similar results for PHN, although the magnitude of the swing wasn't as pronounced. This pattern was preserved even when people were on active treatment. Pain scores overnight (8pm to 8am) weren't, unfortunately, recorded for the trial. Why this happens I don't know. In their discussion, the authors make murmurings about circadian fluctuations in neurotransmitters and endorphins, and ask whether melatonin (which increases at night) is pro-nociceptive. Clearly, however, no one knows--nor is it known how significant this is outside of chronic neuropathic pain--but the figure dramatically displays how real a phenomenon this can be. Ever seen a drug rep sales pitch?